Silver level hosting is the most popular plan we offer. for $10 you get 10 gig of disk space, ftp access from 9am to 5pm 7 days a week. Up to 5 support e-mails each month that we will actually answer in 24 hours. Low downtime commitment. Sealed server in our data center, high speed computers with SATA hard drives on our high speed network. Redundant power and Uninterupted power suplies. 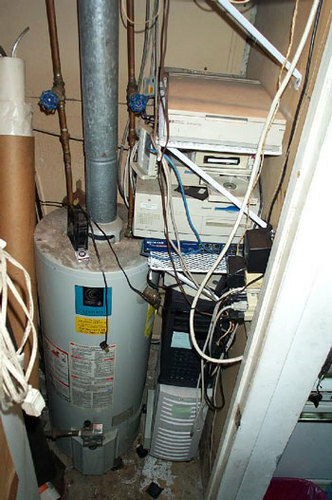 All commercial servers are on a seperate circut breaker than the rest of our house. There is no chance that a hair dryer or toaster will trip a breaker because they are on their own breaker. We have a profesional power company that provided 50 amps of power to our corporate offices. The power cutoff switch is locked so competitors cannot turn off the power when we are sleeping. Unlimited Bandwith. You get unlimited bandwith through our ISP Bellsouth. One of the top bandwith providers in the world. 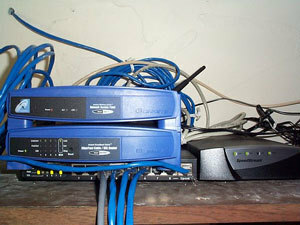 A highly advanced DSL connection through a Linksys router provides fast reliable server access. This is not a slow dial up connection like aol. This is a very fast connection that costs us over $40 a month, just for service. If you want a better service than that you will need to upgrade to the Gold Level Small Business Plan for $20.